So you have been riding all Spring, Summer, and Fall. The weather is growing colder and you are considering hanging up the bike for that long winter hibernation - Do not hang up the bike because winter is coming. For some folks like our founder, just because the mercury takes a dive does not mean he is done riding for the year. Remember this motto people. There is no such thing as bad riding weather, just bad riding gear. Velo Urbano is now going to lay down for you what you need to make winter riding enjoyable. We all remember the saying, might even tell people we love the same phrase when it is cold out, and that is to layer up when you go out to stay warm. This statement especially rings true for how you should dress for a winter ride. There are a number of items you want to acquire to help you stay warm on the bike. First you want to purchase a good base layer top and even base layer bottoms if you are more on the cold side. Then you want to get yourself a good mid-layer winter cycling jersey and winter cycling tights. You also want to purchase a nice winter cycling jacket along with some winter cycling gloves, shoe covers, and something to keep your head and face warm. Additional items like air activated hand, feet, and body warmers can be purchased and used with your winter cycling kit to help you stay even toaster. A good set of base layers goes a long way to helping you stay warm. What is a base layer you might ask? Well base layers are kind of like thermals we remember our parents putting on us as kids, except thinner. With new high-tech base layers, especially those specified for cycling, will help keep you warm on the bike by wicking away moister from your body and some models will even have wind blocking panels in them. Base layers come in a variety of different colors, but we recommend black since darker colors retain heat better. There are many base layer makers out there and a number of them produce other bicycle related products. Our founder and a few other members prefer base layers produced Craft. Craft makes a number of base layers that can meet any riding conditions. Our founder uses Craft's Active Crewneck Long Sleeve base layer and it is plenty warm for his riding needs, but as we stated, Craft makes a lot of different base layers and offers some that are far warmer than the one our founder uses. 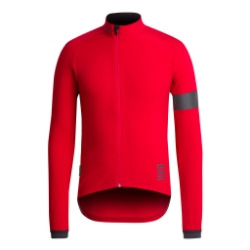 A good mid to heavy weight long sleeve cycling jersey can make what might be a very cold ride into an enjoyable experience. You want to make sure the jersey has a high collar to keep the wind off your neck and a brushed wooly interior that will help the jersey trap additional heat making you feel even cozier. Now there will be days when it might be windy and their are jerseys out there that have wind blocking panels, that way the wind does not cut through you. Cycling tights are another important item in your winter gear arsenal. Our founder prefers bib tights, but your normal winter cycling tights will do. You want a cycling tight or bib tight that has a brushed wooly interior and wind blocking panels on the front. We also recommend you get tights or bib tights that have a chamois pad for your riding comfort. Depending on the tight or bib tight, some may have ankles that zip open allowing for easier foot entry through the bottom of the tight, while others will have you simply push your foot through the bottom of the leg. Most high quality tights or bib tights will have this zip ankle and our recommendation is that you purchase tights or bib tights with this type of ankle. If you happen to ride when it snows or rains out, there are tights or bib tights that are water resistant. An obvious piece of the winter wear arsenal is a jacket, but not just any jacket, cycling specific jackets are different than other types of winter sport jackets. Cycling jackets are constructed in a way that is conducive to a cycling position. Cycling jackets have articulated arms allowing for easier movement and a longer back to keep your lower back covered as you bend over to reach the bars. You want a jacket that is water resistant or proof, but keep in mind water proof jackets do not wick away moister like water resistant jackets. You want a jacket that has a high collar to keep the cold air off your neck and pockets on the back to store your lose items like a cell phone and wallet. You want a jacket that has reflective details to make you more visible to moving cars. There are also cycling jackets that have wind proof panels, which will keep the wind from cutting through your jacket keeping you warmer. I founder is very found of jackets by Rapha and Castelli because of the quality construction and materials along with their stylish looks. Depending how cold it is will determine what kind of gloves you will need. When the temperature is above 50 degrees, a nice full-fingered gloved that is wind proof will be enough to keep you hands warm. When the temperature drops into the 40s and lower is when you need to start wearing an insulated glove. Now there are many insulated gloves on the market, but you get what you pay for like anything you buy. If you decide to go for the inexpensive glove, it will keep you warm, but the glove will be bulkier leaving you will less dexterity. If you decide to go with a more expensive glove, it will keep you warm and it will provided you with far easier movement of your fingers. There are even different styles of gloves out there on the market. Some will be just like your normal winter looking insulated glove. Other types of cycling gloves will look like mitts or like lobster claws. Our founder uses the lobster type gloves produced Pearl Izumi. Our founder likes Lobster gloves because they provide the warmth of a mitten, but gives you the ability to move you fingers some what independently. Shoe covers are another important element needed in you winter riding wardrobe. There is nothing worse than having cold feet on a winters ride - Shoe covers will help keep your toes warm for those long winter rides. How shoe covers work is that they are kind of like a sock that you pull on over your shoes to provided a wind and water barrier. They are held in place with a hook and loop fastener and usually have a wooly interior for added warmth. There are many brands of shoe covers out on the market, some designed for road bike shoes and other designed for mountain biking shoes. Just like gloves, you get what you pay for. The more expensive the shoe covers, then thinner the shoe cover will be without sacrificing warmth and water resistance. Our founder uses Pearl Izumi P.R.O Barrie WxB shoe covers, he likes these covers in particular because they are wind and water proof, providing great foul winter weather riding protection. Now we are going to talk about protecting your face and head from the cold. We all know that protecting your face and covering your head can make a big difference in keeping you warm, this is no different on the bike. There are a number of ways to keep your face and head warm. Lets talk about keeping your face warm first. The standard go to when it comes to protecting your face from the cold in the cycling world is the balaclava. What is a balaclava you ask? It is basically a ski mask. The balaclava is nice because it not only does it covers your face, but it also keeps your head warm too. If you are only looking to carry around one piece of gear in order to keep your head and face warm, then a balaclava is for you. The other option for keeping your face warm, but does not protect your head from the cold is the winter buff or collar as is it is called. The winter buff or collar is kind of like a scarf, but of course there is no need to tie it because it shaped like a tube you pull over your head. When it is warm, you can pull it down off your face and leave it around your neck. When it gets a bit colder and you desire to keep your face warm, you can pull it up over your mouth and nose. Our founder prefers this type of face protection over the balaclava since it is easy to pull down off your face once the temperatures rise on the ride, something not so easily done with a balaclava. Nothing is nicer and looks better than a good winter cycling cap, or just a cycling cap in general. Our founder and a lot of our members enjoy wearing winter cycling caps over balaclavas and cyclist skull caps for a simple reason, the visor that a cycling cap provides. On those clear sunny winter days, the sun can be blinding. While you can always wear sun glasses, those that cannot because of their need for corrective lenses, the visor on a cycling cap is a godsend. Just like a balaclava, a winter cycling cap protects the ears from the cold and wind, but unlike a balaclava, the winter cycling cap comes in many colors and styles. The winter cycling cap is usually made out of wool or some other installed man made material and has a flap of material that covers the ears and the upper back of your neck. These caps come in all different price ranges and produced by many different companies. We recommend you check out the caps produced by Rapha and Walz Caps. Another addition to your cold weather riding kit that you might not have considered or known about are chemical toe and feet warmers. These little things can make a big difference on the ride, enabling your feet to withstand temperatures that might have caused them to go numb had you not had warmers in your shoes. Toe and feet warmers are air activated, so pull them out of their sealed plastic sleeve well before your ride. We recommend that you pull out the warmers at least 30min before you put your shoes on. The toe warmers should last anywhere from 3 to 6 or more hours depending on their manufacturer, so if theres a chance you might be out longer than the warmers will last, bring an additional pack. It should be noted that toe or feet warmers cannot be worn sock less and if done so might result in a burn. Now that we have taken you through a list of things you need to keep warm on a winters ride we hope you do not call it quits due to winter's cold. There are a lot of benefits to winter riding. The scenery of a winters ride is beautiful, the roads are usually less crowded, and that hot coffee taken at a cafe while on that ride taste just so much better. Plus there is also the bragging rights of being able to tell people that you ride no matter what the temperature. We hope that you will keep riding all winter long and that you will be joining us for those winter rides.